David Carbonara’s winning mix of contemporary score and period jazz delivers a distinctive sound that has become a part of the series as much as the timeless visuals and characters. The album also includes A Beautiful Mine, RJD2’s original theme from the TV series. tribulations of a New York ad agency in the 60s stands as a colossus of contemporary television with two BAFTAS, three Golden Globes and fifteen Emmys to its name. "You might expect a Mad Men soundtrack to be a collection of martini-smooth but mundane notes – something you can put on and forget about when you run out of Harry Belafonte vinyls but still require a musical backdrop to smoke and romance a dame to in your Manhattan bachelor pad. But Mad Men: On the Rocks turns out to be anything but '60s make-out noise. In fact, it's a thoroughly comprehensive demonstration of series composer David Carbonara's musical dexterity when it comes to setting a score to Don Draper's drinking. Carbonara takes a number of musical styles and shakes up an audio cocktail to pour in your ears, creating tracks so individually distinct you could almost be fooled into thinking they weren't born from the same show. The lilting Irish tones of 'Betty Home and Sally's Story' stand in contrast to the Western whipcrack of the cowboy-themed 'Glo-Coat', while the crisp Madison Avenue swagger of 'The Arrival' bursts in to remind you just what show this all came from. It makes for an album that not only tours every dramatic aspect of Mad Men, but is a genuinely pleasurable listening experience and manages to avoid completely the banausic ear-porridge of sameyness that many TV soundtracks (including the previous release Mad Men: After Hours) suffer from. Do we need to get Don Draper in here to sell it to you further? Just go and buy it. "Listening to these pieces on their own will have you wanting to re-watch the series with a new appreciation, and you can’t ask for more than that from any soundtrack"
“Mad Men’s” well-blended martini of emotion, and NYC nostalgia goes down smooth, with feeling." 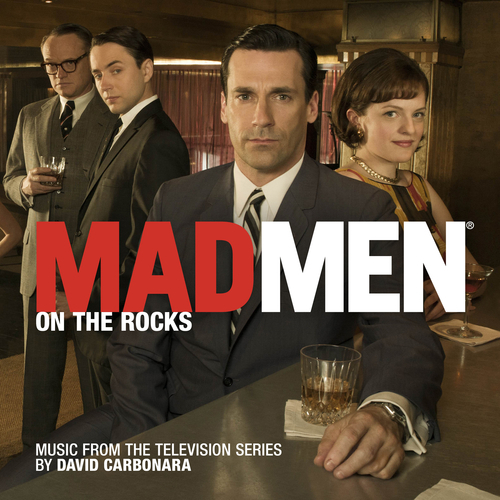 Most awesome TV Soundtrack of 2013: "Mad Men On The Rocks" by David Carbonara. Classy, elegant and first class just like the hit AMC series a soaring soundtrack by Carbonara that really deserves another set of CD's just to get all the music which is tremendous.